Our Best-Dressed Man of the Year is Ethan Newton, founder of Bryceland’s Co - the store in Tokyo and now in Hong Kong. Ethan received many nominations from readers, as did Andreas Weinas (of Manolo.se and other publications), several of Japan’s finest buyers and creators, and then a long list with two or three mentions each. The judges, however, (myself, Michael Drake and Jamie Ferguson) were particularly interested in highlighting the originality of Ethan’s dress, and his ability to combine classic style with casual, workwear clothing. These themes of mixing tailoring with workwear, and dressing a slightly larger body, dominated the discussion I had with Ethan this week about the award. Permanent Style: You seem genuinely surprised to win this award. Is it really surprising, given the following you’ve always had, even going back to the Armoury days? On Instagram - and Tumblr back in the day - my market was always larger guys who wanted to wear tailoring but couldn’t imagine looking like Alan or Andreas or anyone like that. That really surprises me, but I guess the things I always find inspiring are the ways people combine colours and texture, and the combinations of different styles - which aren’t related to physique. I think I focused more on those things because of my size. I couldn’t rely on just being a good figure for tailoring - wearing the simple things and looking good. I needed to express myself more. What particular aspects of tailoring are harder for larger men? Trousers are certainly harder. 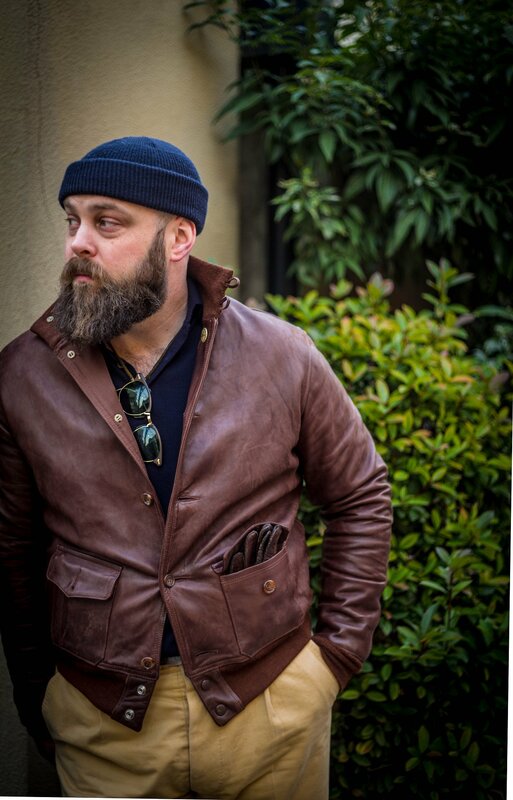 It’s not too difficult for a larger man to find a jacket that has enough drape to look good. But trousers have to be cut completely differently if you’re big in the seat and thighs. This was the foundation of my relationship with Salvatore [Ambrosi, Neapolitan trousermaker]. I kept on pushing him to make me something that was a little fuller, with some drape and two forward pleats. This is also a question of style though. I’ve always believed that men can’t look stylish if they’re not elegant, and they can’t be elegant if they’re not comfortable. You need a little bit of room and drape to move properly. What is the main challenge with trousers? Is it the position of the waist, whether it goes above, below or on the stomach? That’s important, but the bigger issue is often in the thigh. 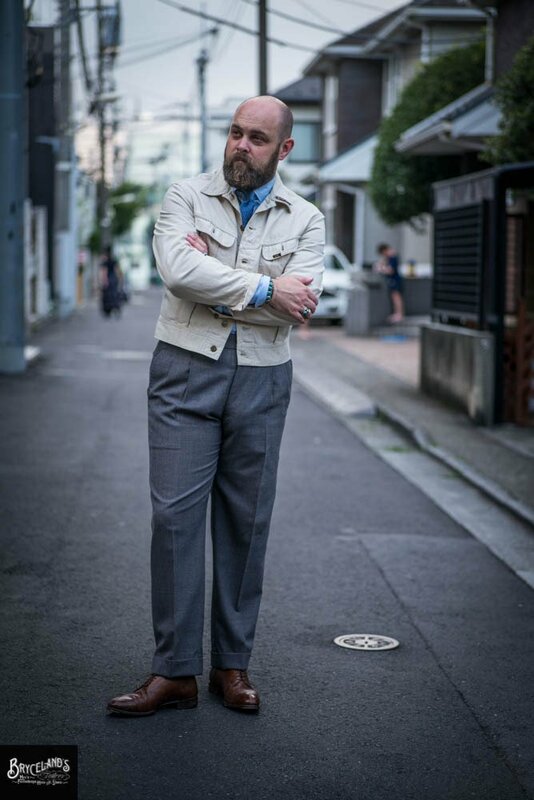 Few tailors, particularly in Japan, can fathom how much extra room a man like me needs in my stride - my walking thigh. Twenty-nine inch thighs probably get up to 33 inches when I lift my leg. Then you need a back rise that’s high enough, because you lose inches of it when you lift your leg. That’s the only way to avoid what we call in Australia a ‘tradesman’s cleavage’. 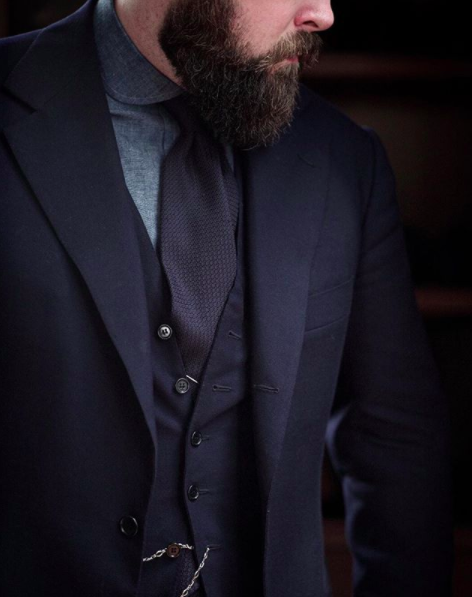 How would you advise someone on wearing tailoring and workwear? It feels like there isn’t much guidance in this area, perhaps because brands tend to stick in one space or another. 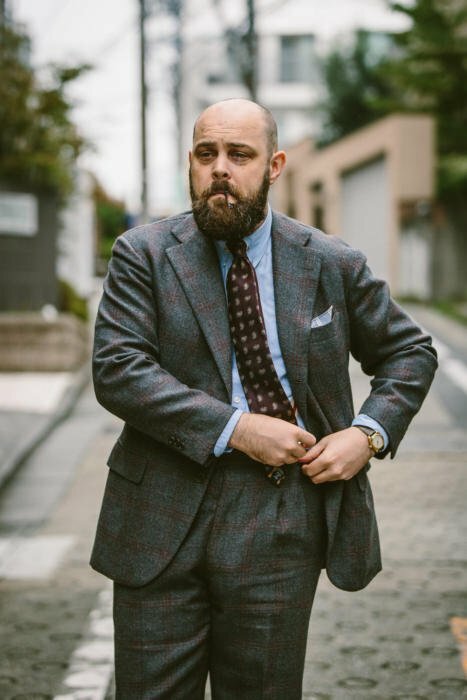 That’s something that has come directly out of my experience with bespoke in Japan and Korea, where guys tend to be very siloed in how they dress. You’ll have a customer where bespoke is so much a part of his identity that he goes to the beach in bespoke trousers and a sports coat, or hiking in bespoke clothes and handmade shoes. For me, the sense of occasion is crucial. You have to be able to dress beautifully for any occasion or you can’t say you’re well dressed. Otherwise it's Cosplaying. My interest in vintage is driven by a belief that there are pieces of clothing that are so perfectly designed for certain uses that they don’t need improving on. And we want to offer them for those uses. A guy that has a perfect three-piece suit for a weekday should also have a pair of 501s and a great white T-shirt for the weekend. Or chinos and a leather jacket. How about mixing those two together? I think that’s the area that readers often find hardest - but potentially most interesting. In the image above, for instance, why does that hat work with tailoring where another wouldn’t? A lot of it comes from references. 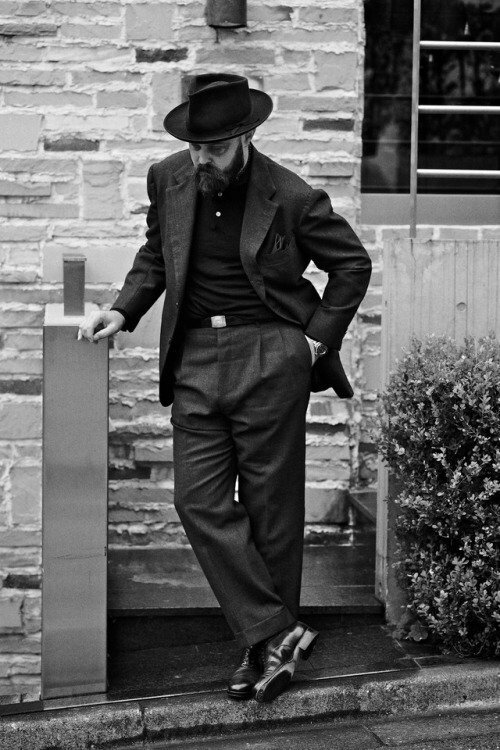 The hat in the picture, for instance, is a stratoliner from Stetson. It’s an original from the 1960s. The stratoliner was a western hat, but it wasn’t an open-road hat - what we would think of as a cowboy hat. If you look at old films with Jimmy Stewart, he would wear something like this with a suit in the same way. Is there a principle we can establish from that? For example, for a hat to work with a suit it has be similar proportions to a classic hat like a fedora, but the material or colour can vary? Yes, although the material’s not that different, it’s just a lighter colour - what was called ‘silver belly’. It would have been a fairly standard hat on the west coast of the US. How about this second picture, in the shorter jacket and grey trousers? That’s a Lee Westerner from the 1960s, with grey fresco trousers from Ambrosi and split-toe shoes from Saint Crispin’s. What kind of jacket do you think works with that combination - with more formal trousers and shoes? Well the first thing is always the proportions. I want to look tall and strong, so the trousers are high-waisted and reasonably loose (though not as loose as they should be - blame my expanding waistline!) They’re on the waist rather than the hips, which makes me look slimmer, being a smaller circumference. And the jacket is short and neat. And in terms of material and colour, do you see the Westerner as slightly smarter than a brown leather jacket, say, or a blue-denim jacket? Yes. You need to keep the materials and textures in balance. I’m wearing a necktie and a broadcloth shirt here, and I probably wouldn’t wear that with a denim jacket. There would be too much of a contrast. The Westerner is in a pique cotton that isn’t smart, is a little more polished. It balances out well. And with a more casual jacket you’d remove the necktie, perhaps wear a more casual shirt and shoes? Yes, with more casual pieces - like in the image below. Here I’m wearing a beanie and a knit rather than a shirt, with cotton trousers rather than wool. So it’s much more consistent. But again, you’d be happy to wear that same leather jacket with flannels and an oxford shirt? Absolutely. A button-down oxford with reppe tie or a knit tie. A proper hat rather than a beanie. But not a silk tie and elegant dress trousers. That would be too far. How much do you think your customers can actually wear unusual pieces like you do, such as western hats or jewellery? I certainly don’t expect my customers to wear everything I do. It has to be appropriate to their lifestyle and situation. One of the great things Karl Sussman, a tailor in Australia, used to say to me was, ‘As a retailer, we have to go to 100%; only then can we expect customers to hit 80%’. He meant that if we consistently play it safe, and never go beyond 70% of what we think might be interesting, a customer’s never going to go that far, never going to try new things. It’s my job as a retailer to suggest things, and then for the customer to take it as far as they’re comfortable with. They might wear the hat, but with more casual clothing. Or they might wear the three-piece suit in the office, but without the watch chain. I think some men feel they have to wear everything together, just as the man in the shop is wearing it, or the model in the advert, otherwise they’re not sure it will all work. They don’t have the confidence to deconstruct it all. Absolutely, it's hard to advise completely except in person - which is one reason we re primarily a retail store, not an online store. Who would you have voted for in this award? Among the men that were nominated I think George [Wang, of Brio in Beijing] would have been a good choice. He both wears clothing well and expresses himself - he's not afraid to play with it a little. I always prefer that to guys that just copy one, narrow look; it often feels derivative. You can follow the discussion on Best-dressed man 2018: Ethan Newton (or, how to dress the larger man) by entering your email address in the box below. You will then receive an email every time a new comment is added. These will also contain a link to a page where you can stop the alerts, and remove all of your related data from the site. Thank god it wasn’t someone with all the right proportions ! While women’s fashion goes on about the ‘plus’ size model we’ve voted him as the Best Dressed Man. But then we’re about style not fashion. Yes, trousers get wasted faster than jeans, but nothing is perfect in this world. As for the T-Shirt and leather jacket – I am waiting for Simon’s article on his experience with Chapal MTM. I like the quality of Chapal, but I am still not sure that the fit and style are my thing and I want to see how the jacket will fit Simon. Frank Spencer has let himself go in the last picture. Definitely a good choice. A sartorial sensei who is not a poser and who looks like he eats now and then. He makes some great points but you have to have it in your blood to get this good. “For me, the sense of occasion is crucial. You have to be able to dress beautifully for any occasion or you can’t say you’re well dressed. Otherwise it’s Cosplaying.” – Good man, and well-deserved winner in this category! Good job by the jury as well. Ethan Newton didn’t come to my mind but he is very deserving of this award. He is elegant and very thoughtful in how he approaches clothing. He shows how a large man can dress well and not look sloppy. Although my own physique is the polar opposite of Ethan’s I can learn a lot about dressing well from him. Certainly a well dressed individual with a clear and deep knowledge of style but the element of colour seems very limited in his wardrobe.. which thus makes it rather drab (though maybe the overcast backdrop did not help). You cover the subject of hats well but they can date an outfit by making it a bit fuddy duddy. Alternately he should not feel abashed as a large man being judged in a positive way as he carries his weight well and looks authentic in every shot. Indeed it could be a career path as he transitions from tailored to work wear with ease. As a footnote I noted that many in the nomination group were industry based either in retail outlets or writers. Surely there are some outside this group worthy of nomination next year? Thanks. There was a long tail of non-industry people, but I guess they tend to be less broadly known, and get fewer nominations overall. Still, if we had seen anyone in that list that we thought deserved to be in the top 5, we would have elevated them. Simon, why wasn’t Luigi Solito on the list? He is a sartorial genius always well turned out and my sartorial hero. I like the way Luigi dresses. He only received one nomination, however, and with the top five we shortlisted here, we felt they were more individual in their style and combined different things well. Hi Simon, I don’t disagree with this choice, Mr Newton is indeed a man of style. However, I think it may be useful to point out the difference between a ‘selling’ dresser and a well dressed man (I admit that they are not mutually exclusive). 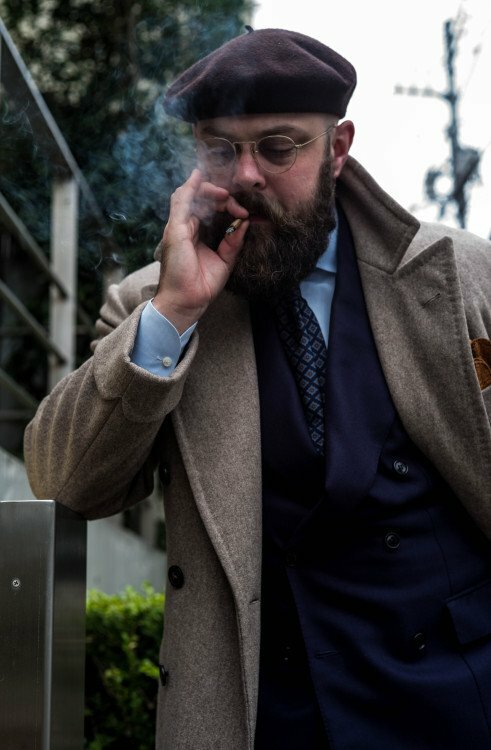 Men like Mr Newton, MH from Drakes, AS from The Armoury and Brunello Cucinelli all ‘represent’ their various brands when they dress, whilst men like you, Bruce Boyer and the Prince of Wales dress for yourselves. This may be a subtle distinction but it should be noted that some men are ‘selling’ as well as dressing. On trousers for larger men: The question of trouser height wasn’t really answered on the article. As for me, I have a bit of a belly but relatively small seat and thighs. With casual trousers this leads to a problem that pants really quickly slide down to the hips even if the rise is a bit higher. (It does not look good and makes my long back look even longer. And I have to constantly pull up my pants.) Is there any remedy for this? With suit trousers I can use suspenders or even get a rise that reaches above the widest point (around the belly button), but these options are rarely suitable for casual trousers. There is only one solution to the problem you outline, and that is to wear braces. Providing your waistband sits as the right spot, they will stop your trousers from moving. Only really applicable to formal trousers as you can’t wear them with chinos, jeans etc. It’s definitely worth taking a look at this from the pen of this year’s winner. really great interview. Great view and insight on the subtleties of combining casual/workwear and formal garments. And I agree, it’s easy to look good being tall and slim but it can be a challenge if not… E.N. is the best example that it works out well – with confidence and style. A well deserved winner! does any one here know who was the first smartie to popularise “distressed jeans” as “cool”, and then sell it to old folk as fashionable? My mother would have said: You’ve got a hole in your trousers dear, do you want me to darn it? Marithe and Francois Girbaud, 2 french designers. They didnt popularise it, they invented it (among hundred other things), with the stone washing technique. First, since I haven’t got enough time to even participate in the entire initiative, I would start by making few belated observations. The whole endeavour is definitely a great idea! As to Drake’s, for me it’s one of the haberdasheries, which are – aesthetically and culturally – the closest to PS’s readers. It’s a mainstay within our environment. Therefore its being nominated isn’t a great surprise to me! As to Ethan as the best-dressed man 2017 isn’t a surprise either. Peter K’s comment is what I would assume in this case. But why would someone like us see Ethan as a source of inspiration in the first place? For I think I’ve read or seen quite all what he has posted as comments or pics since the time he started running Old Rugged Salt down to Bryceland Co Instagram. I think the answer is authencity. Ethan is authentic in his style. And he seems to be attracted to what he deems authentic in others too. 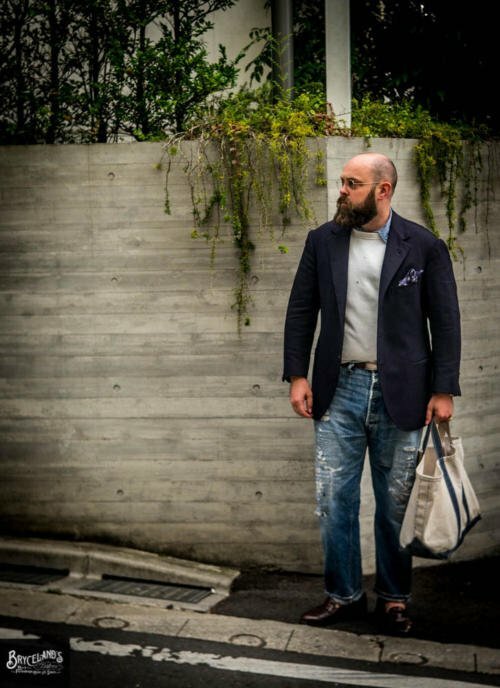 One very good example I have found while browsing through his blog is a Japanese man who often appears wearing just a pair of chino, a T-shirt and a hat. Very simple as an outfit, and yet profoundly authentic! However, in one instance Ethan succeeded in making me set my sight on one specific item: a St Crispin’s brogue. Actually, it was just a comment of his, explaining why St Crispin’s shoes are the ones that meet his requirements due to how he is built. Frankly, I’ve rarely read such a powerful advertisement that actually wasn’t the purpose of a statement. 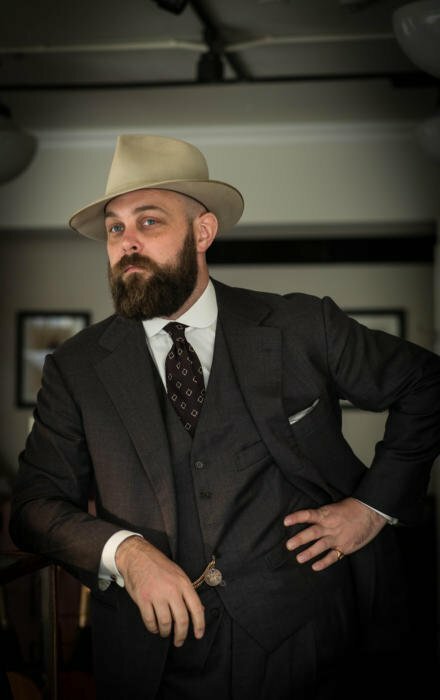 I sorry very much Permanent Style readers did choose Ethan Newton and not to Bruce Boyer… to me founder of Bryceland’s Co is not too bad dressed men but is not the best. 🙂 George is singular. Joke by the side. Bernhard Roetzel is a great writer, but this does not make him a style icon. He wrote The Gentleman as an assignment and he did an excellent job. And as this book was so successful, he later specialized on the topic and this became a part of his identity. Partly in order to monetize on the momentum that people who read the first book and liked it, would most likely buy a second book by him on a similar topic like a book on shoes. This is a common economic sense. But this does not make him per se a style icon. He just dresses in his interpretation of an elegant British countryside outfit, but nothing particularly inspiring. Thank you you so much dear Hristo for your reply. I think the elegance is an inside valour…. other interpretation is secondary to me. Simon is a great (good) writer but that does not make him a style icon either. I have the feeling that most people who comment forget that the idea is of an anual award. So if somebody has not won this year, one could win next year. There are a lot of people deserving Oscar for lifetime achievement, but the Academy does not award them all at once in a single year. Aparf from that if this is an award for 2017, then it is perfectly understandable that BB and PoW are not getting the award regardless of their merits. They were not particularly visible in 2017. This is also why they did not get so many nominations. One has to be visible in the online and offline media for getting such an award. I am sure that there are thousands of no name no Instagram people, who dress better then BB, PoW or EN, but we have never heard of them and never seen them so they are not on the list. Being visible in 2017 is part of the game. Bravo! I am a long time reader (first timer in the comment section surprisingly) that always appreciates your content. This article is particularly relevant to me personally . As a short, stocky fellow it is enormously hard to find clothing that is flattering or just fits in general! Highlighting Ethan as a menswear arbiter is refreshing for those of us that struggle with clothing that is seemingly always made for taller, slimmer men. Although bespoke is invariably out of my price range, it is always a guilty pleasure to read and observe the clothing on PermanentStyle. Thank you again from the other side of the pond and keep up the great work! Of all the nominees, Noboru Kakuta is to me the most interesting choice amongst the finalists. I would have thought that he would be too simplistic in his style to be included. However, his approach to proportion is unmatched! Great read ! Will you also profile the runners up at some point ? BTW, Alexander Kraft seems to be missing from the runners up list, he received quite a number of nominations… ? No, I think we’ll leave that for other years, when I’m sure others will win. Alexander was in the top 10 for nominations, but didn’t quite get the judges’ vote for the top 5. Hello Simon, great article on Ethan, he has a beautiful and consistent aesthetic. Could you inquire about his leather jacket, is that something that he sells? As far as I know, it is a replica A-1 flight jacket made by Eastman Leather, not an original vintage one. He does sometimes wear the replicated leather jackets, especially for ones like A-1 jackets that are just too rare to find. Stylewise, the Leather jacket he is wearing is a classic. They’ll be happy to make the jacket to your specifications regarding leather, lining, and measurements. PS: I am in now way associated with Aero Leather Clothing, just a happy customer that wanted to give a heads up. Great style. I was so relieved that the ‘ Armani Man ‘ motif was nowhere to be seen! Good choice for the best dressed man. As a number of others have mentioned, it’s a rare joy to see someone of the slightly more well built fraternity take such an accolade for once. I am very new to your site and have been wanting to ask two questions, and feel that this award is the right setting. Being of a bigger build myself, I have long found that going into most decent men’s shops quite a trial. I have had a couple of experiences with bespoke, a suit which was a disaster and some trousers which were not bad. My first question relates to whether you have suggestions for which tailor in London (or possibly in Italy as I travel there a lot) would be the one to to make trousers that fit Ethan’s description. I think his suits look incredible and the way the trousers sit is perfect. It seems that being large there is always the sense that trousers should be wide at the bottom and have a huge break, both of which I have never liked. So what kind of things should I be asking for when making a jacket and trousers. My second issue is a very different one. I work in a world that not only dresses casually, but rather reacts to the idea of dressing up. I often try to find reasons to justify the use of a tie, which invariably raises comments. Something I find tiresome and childish. I have now accepted this and am comfortable enough dressing up. However, I am sure that suits would raise a whole other level of remarks. I just wonder if others have this issue and how they deal with it. Anyway, I appreciate any suggestions. Thanks. Most tailors will be able to make for you, and won’t vary that much. I’d suggest Dalcuore perhaps, as they have a fairly roomy cut, but the difference is small. The biggest thing will be deciding your happy with braced trousers, for instance, which can work much better on a larger man. That won’t help you much with your second point, however, on standing out. It’s the biggest reason I don’t wear braces. In general on this point, I’d say that you need to ignore most comments, but also be aware that you can’t stray too far from the norm, without just being unsuited to the environment, which is a big part of being elegant. Thanks Simon really appreciate it. In fact I should say that braces are an extravagance that I have long succumbed to. I recently bought a beautiful pair at Shibumi, thanks to a link I found on your site. I take your point about straying too far from the norm though. As for the recommendation on tailor I appreciate that and will look into it. Thanks again and congratulations on an excellent site. I love ties, and can relate to your wanting to find ways to wear a tie more often. I also feel self-conscious about the unbuttoned shirt and the hair the peaks through, so I prefer a fully-buttoned shirt. I think the key is to dress down the whole outfit to be closer to the level of everyone else. So start with a more casual tie (knit or heavily textured, strong pattern) and then combine with with a more casual ensemble (chinos or jeans, denim shirt or coloured oxford button-down, half-zip or full-zip knitwear, casual jacket with a zip). With all that, the tie looks like a style flourish but the outfit suits the moment. I’ve been hoping to experiment a little with a subtly coloured but patterned ascot as a way to maybe vary this a little. I’m a bigger guy living in the US (52L suit, 18 neck, 40 waist 32 Length). Aside from made-to-order are you aware of any brands that might carry these sizes? I find most haberdasheries cater to the little guys, lol. Occasionally, I find a nice 2X or 3X shirt, but it will fit like a halter top. Too short. I wish more of the nicer brands offered options for larger men. Seems like there’s an untapped market.